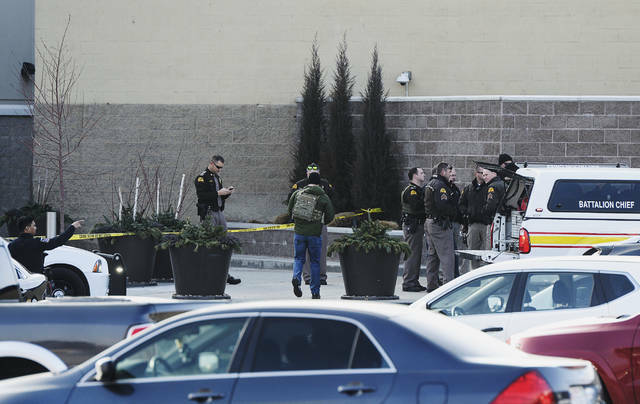 MURRAY, Utah (AP) — A shooting at a suburban Salt Lake City mall that sent hundreds of panicked shoppers fleeing started as an argument between rival gang members inside the mall and later erupted in gunfire outside, leaving two people wounded, police said Monday. Two 19-year-old men were arrested on suspicion of attempted aggravated murder, but investigators are not yet sure if either of them fired the shots that hit the victims, who were also involved in the fight, said Kenny Bass, a police spokesman in the Salt Lake City suburb of Murray. Shots were fired by the both sides, and those injured were believed to be people with the gangs. No bystanders were hit or injured, Bass said. Compounding the pandemonium, a fire alarm at the Fashion Place mall that had been malfunctioning for days went off inside the mall, sending people running for exits, Bass said. Shoppers reported hearing the alarm after the shooting started about 1:30 p.m. and evacuation orders over a loudspeaker, while employees said they hunkered down in stockrooms and waited. 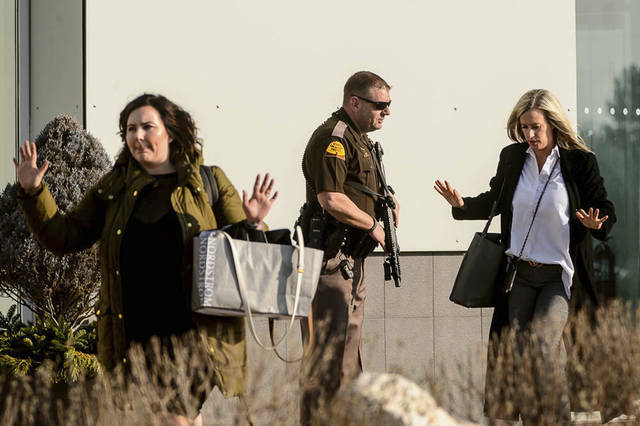 The first alarm was inadvertent and happened seconds before the shooting from the food court, triggering a subsequent message on the loudspeaker that it was false, said Lindsay Kahn, spokeswoman for Chicago-based Brookfield Properties, which owns the mall. After the shooting, a second message was played telling people to evacuate or take shelter, Kahn said in a statement. “We recognize this created confusion and was truly an unfortunate coincidence,” Kahn said. Kahn said the company is reviewing security measures, but declined to disclose details. “The universe is taking care of us,” said Caballero, 21. Investigators are still looking for others involved in the dispute and trying to locate more witnesses, Bass said. The members of the rival gangs crossed paths by chance in the mall and their argument turned physical after it went outside, Bass said. One of the two victims, a woman in her early 20s, was treated and released hours after the shooting broke out, Bass said. A man, also in his early 20s, remained hospitalized Monday in critical condition. The suspects were identified as Jesus J. Payan-Mendoza and Jorge Crecencio-Gonzalez. No attorney was listed in court records for either man. Fashion Place is a popular shopping center in the heart of the Salt Lake City metro area. It was open Monday, with an increased police presence. Shopper Sean Sasso stopped by the mall to before going to work as a pharmacy technician, saying he had heard about the shooting. “I’m not going to live my life in fear and not come to the mall because there was a shooting yesterday,” Sasso said. 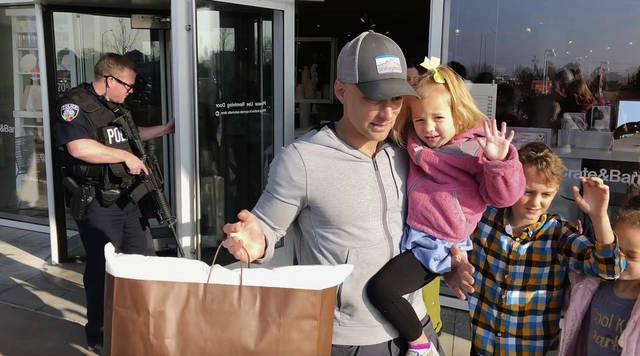 Corey Robison took his three young children to get breakfast and walk around the mall while his wife went to a doctor’s appointment nearby. “I feel like it’s unlikely to happen ever again,” said Robison, a graphic designer from California who has lived in Utah for three years. A 2007 shooting at a different Salt Lake City mall killed five people and wounded four others. The 18-year-old gunman was killed in a shootout with police. Erin McHenry-Sorber does not work for, consult, own shares in or receive funding from any company or organization that would benefit from this article, and has disclosed no relevant affiliations beyond their academic appointment. Partners: West Virginia University provides funding as a member of The Conversation US. The first mass teacher labor action of 2019 is unfolding in California as the United Teachers Los Angeles walked out for the first time in 30 years. This strike, which began on Jan. 14, isn’t just important to people in Los Angeles. Here are three reasons the nation should pay attention. The Los Angeles strike stands out because of the size of the district. With 640,000 students, and about 500,000 enrolled in the district’s public schools, Los Angeles represents the second largest school district in the United States. The only bigger district is New York City. Also, the political context is different. When West Virginia teachers walked out of the classroom, they were battling a conservative state legislature in a largely rural, majority-white state. Los Angeles is urban, far more diverse, and located in a state that has voted mostly Democratic in presidential elections since 1992. Los Angeles Unified School District’s student population is 73 percent Latino, 10.5 percent white, 8.2 percent black and 4.2 percent Asian. The district serves over 150,000 students whose first language is not English. The situation for the Los Angeles teachers union is also different in several ways. For instance, it is engaged in an active fight against the rapid growth of charter schools. Los Angeles is home to the largest number of charter schools in the U.S. with 277. Since 2008, the charter industry in Los Angeles has grown 287 percent. According to the Los Angeles teachers union, this is effectively siphoning US$550 million per year from the district’s traditional public schools. The union argues that Los Angeles Unified School District superintendent, Austin Beutner, is a pro-charter school superintendent with no education experience. The teachers union has proposed greater transparency and more accountability for Los Angeles charter schools and has called for an immediate cap on charter school growth in the school district. The district has provided no counter offer to these demands. Teachers in Los Angeles have negotiated the current contract under dispute for over 20 months, and have been working without a contract for over a year. This is not uncommon. For example, teachers in Oakland, California, have been working without a contract for more than a year. And a recent contract resolution following a Pennsylvania school district strike came after teachers worked without a contract for three and a half years. Like strikes in Oklahoma, Arizona, Kentucky, Colorado and North Carolina, the Los Angeles teachers’ strike is essentially about greater investment in public education. The average teacher makes almost 19 percent less in wages than comparable workers. In California, specifically, this figure is about 15 percent. Los Angeles teachers make between $50,000 and $80,000, but the cost of living in LA is so high that a two-bedroom apartment requires a six-figure income. This means many teachers have second or even third jobs. But beyond wages, teachers have begun to demand a greater commitment to investment in public education from their governing bodies, either school boards or state legislatures. In Oklahoma for example, striking teachers protested inadequate instructional materials, including outdated and deteriorating textbooks. And in Los Angeles, striking teachers are demanding, among other things, a reduction in classroom sizes, which can be up to 46 students in some classrooms based on their current contract. Teachers argue that the large class sizes make it difficult to meet the needs of their students. They also want an increase in school nurses, librarians and counselors. These issues get at the heart of student learning. Students need adequate supplies, individual teacher attention and access to mental health services, such as counselors, if they are expected to thrive in the classroom. But the ability for public schools to provide for all of these instructional and social support needs has become increasingly difficult as states have continued to under fund their public education systems. Teacher strikes and work stoppages have been preceded by a nationwide teacher shortage that continues to grow across many states, which do not have enough certified math, special education, science, and in increasing cases, elementary teachers – to meet the needs of their students. In California 80 percent of districts reported a teacher shortage in the 2017 to 2018 school year. Teacher shortages are most often blamed on low teacher pay, one of the commonalities across teacher strikes. These shortages are arguably exacerbated by an increase in the “teacher pay penalty,” the term used to describe disparities in teacher salary compared to professions requiring comparable levels of education. At the same time teachers find themselves increasingly undervalued, most states are still funding their public education systems at levels below that of the 2008 recession. This includes California, which is ranked 41st nationwide in per pupil spending when adjusted for cost of living. As long as public schools remain underfunded, the nation can expect to see more teacher strikes in other school districts and states in the near future. Kelly’s victory last year broke the GOP’s dominance over state government, and she promised a bipartisan administration — a necessity because Republicans still hold super majorities in the Legislature. She defeated Kansas Secretary of State Kris Kobach, who had Trump’s endorsement.